Fifteen of the 20 biggest hotels in the world are in Las Vegas, and there are more than 150,000 hotel rooms in the city--New York City has only half that many. 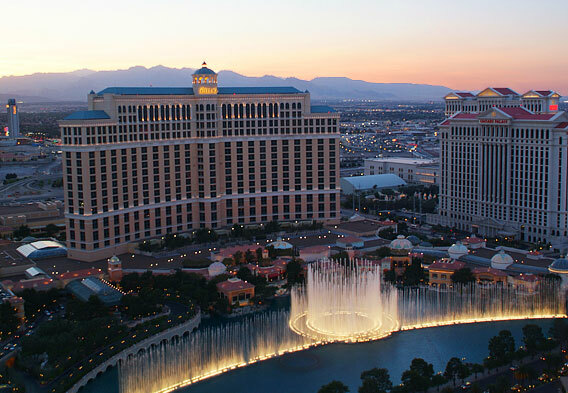 The Bellagio has 3,933 rooms, which is more rooms than the number of residents in the town of Bellagio, Italy. When it opened on April 30, 1999, the Stratosphere Hotel (1,149 feet high, 106 stories) became the tallest structure west of the Mississippi River. Today, it's the tallest observation tower in the US and the second-tallest free-standing structure west of the Mississippi. The Riviera was the first high-rise hotel on the Las Vegas Strip - it was nine stories tall. On a clear night, the Luxor Sky Beam is visible from an airplane 250 miles away from the Strip. There is one operating slot machine in Las for every 8 residents. The Las Vegas Skyline is one of the most recognizable cityscapes in the country. Along Las Vegas Boulevard, also known as The Strip, dozens of astonishing architectural wonders can be seen—these are primarily the hotels and casinos of Sin City, as Vegas is otherwise known. The Las Vegas Skyline is brilliantly lit up by neon lights, lighted fountain displays, and the unique architecture of dozens of tall buildings, which are a vivid contrast to the rest of the relatively flat city. 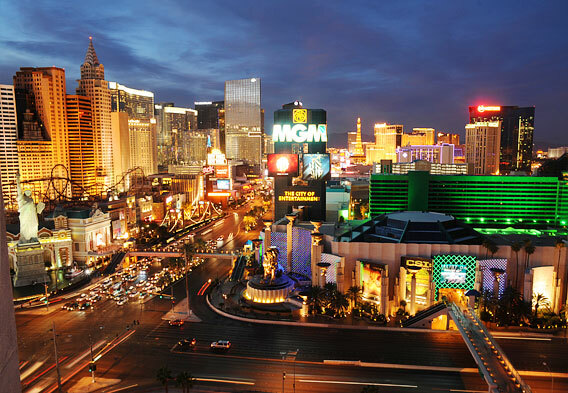 The most famous part of the Las Vegas skyline is undoubtedly the dozens of casinos along the Strip. Some of the largest hotels and casinos in the world are located along the Strip, from the Italian-inspired Venetian to the Roman palazzo of Caesar’s Palace, to the MGM Grand, the Stratosphere Tower, and the distinctive pyramid of the Luxor. The opulent architecture and décor of the Strip’s casinos have made the pedestrian sidewalk a major attraction of Las Vegas, as tourists marvel at the dramatic buildings as well as the outdoor shows, like the Sirens of TI or the Bellagio’s fountains, which have been designed to attract an audience. Among the most unusual facts about the Las Vegas Strip is its location: The street is actually located in Paradise and Winchester, two unincorporated townships, and not in the city of Las Vegas. Among the most popular outdoor shows is the music, light and water show at the Bellagio Fountains, a fixture of the Las Vegas Strip that has become a common feature in Hollywood movies and is one of the best-known attractions in Las Vegas. Every half-hour in the afternoons, and every 15 minutes in the evenings, the Bellagio Fountains perform a coordinated water show, shooting water up to 240 feet in the air, in conjunction with colored lights and set to music. 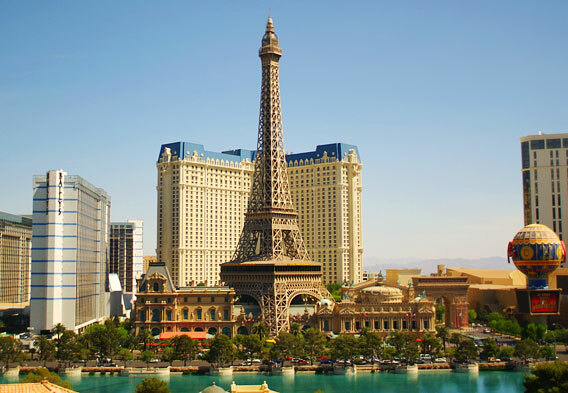 Another distinctive landmark is the Paris Eiffel Tower at the Paris Las Vegas Hotel and Casino. The casino boasts a 541-foot replica of the Eiffel Tower, which towers over the Las Vegas skyline. The back two legs of the Eiffel Tower go through the ceiling of the casino, right onto the casino floor. When lit up at night, the Paris Eiffel Tower is one of the most impressive sights of Las Vegas, and looks almost like the real thing. A model of the Arc de Triomphe of Paris is also prominently displayed at the Paris Casino, and the Eiffel Tower restaurant, located on the eleventh floor is a great dining option if you want to enjoy views of the skyline along with your meal. The New York New York Hotel and Casino is also one of the major landmarks of the Las Vegas Skyline. The hotel features several towers that imitate New York’s skyline, including the Empire State Building, the Chrysler Building, Grand Central Station, and the Statue of Liberty. The hotel brings the best of the New York skyline to Las Vegas. In addition to the casinos, new hotels and luxury condominiums are frequently being built, which means that the Las Vegas skyline changes constantly. An excellent view of the Las Vegas skyline can be found at the Stratosphere Tower, which towers 869 feet over the city and offers a 360-degree view of the Las Vegas skyline. The Stratosphere Tower’s outdoor observation deck is one of the tallest in the country. For people who would like to enjoy the view at a leisurely pace, you can eat dinner at the Top of the World restaurant at the top of the tower, which has a moving floor that slowly rotates 360 degrees—it’s an unusual way to see the city.